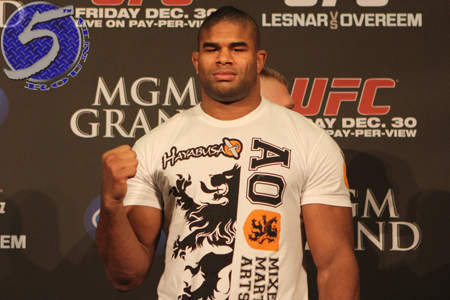 For the first time in forever, Alistair Overeem (Pictured) will be an underdog entering a mixed martial arts scrap. According to the Gambling Gods, champion Junior dos Santos will leave their heavyweight shootout with title in tow. “Cigano” is pegged as a slight -165 odds-on favorite to retain his crown. Overeem, on the other hand, checks in just behind as a +135 underdog. The 265-pound affair goes down at UFC 146. MGM Grand Garden Arena in Las Vegas, Nevada hosts the May 26th shindig.